This pair of sweet antique chairs feature different designs on there backs of musical instruments and cottage carvings. Each measures 13'' Long X 17'' wide X 35'' Tall. Seat height is 19'' Tall. 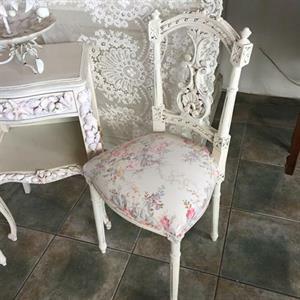 A stunning vintage roses fabric covers each seat. 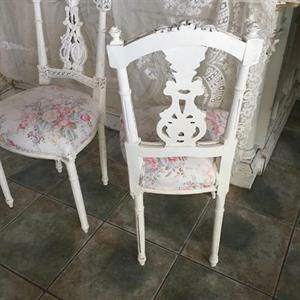 Both chairs have been stabilized and make a perfect addition to the shabby or chic country french and beach cottage decors. please contact me at lucy_torres@att.net for shipping cost..